This campground, which is not operated by the national forest, is conveniently located near trails like Ape Caves, Trail of Two Forests, June Lake, and Lava Canyon. 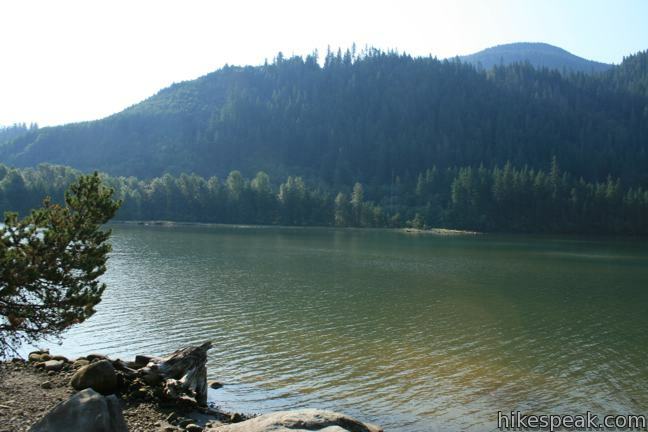 Beaver Bay Campground is a boat-friendly campground on Yale Reservoir east of the town of Cougar. The campsites are stacked fairly close together, but on the plus side, they are just a short distance from scenic waterfront. A $21 per night charge (as of 2016) includes access to showers (no coins needed), full bathrooms, and a beach. Fire rings and picnic tables are at each site. The campground is first-come first-serve with 63 individual sites and 15 group sites. The elevation of the campground is 550 feet. To get to Beaver Bay Campground: From Interstate 5, 140 miles south of Seattle and 25 miles north of Portland, take exit 21 on to Route 503 East toward Cougar. After 30 miles, turn right into Beaver Bay Park. The park is located two miles past the town of Cougar and five miles west of Forest Service Road 83, which is taken to reach Ape Caves, Trail of Two Forests, June Lake, and Lava Canyon. 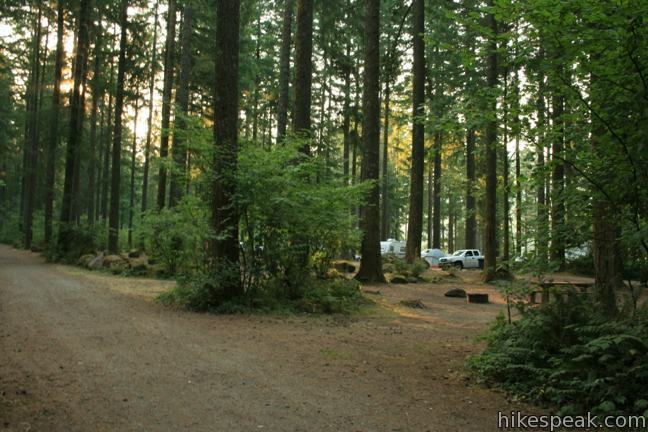 This campground, operated by the Gifford Pinchot National Forest, is located in a shady forest south of Mount Saint Helens and north of the Columbia River Gorge on the Oregon Border. 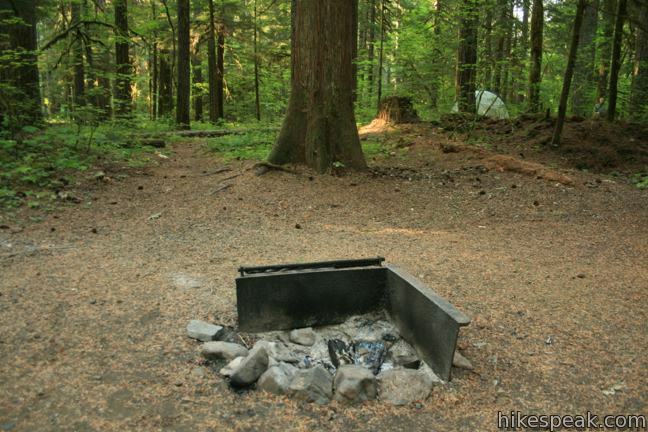 The campground lacks a good source of potable water, and the portopodies leave a bit to be desired, but what Paradise Creek does offer, it offers is camping in a quintessential northwestern forest. 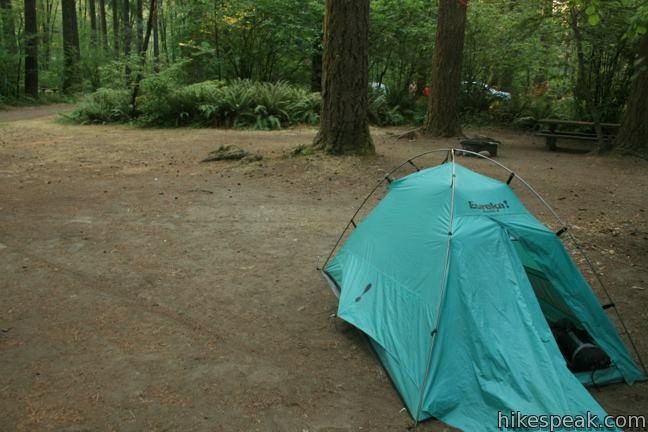 Pop a tent on a forest floor of ferns beneath grand Douglas fir and western cedars. The campground is open seasonally from May to September for $18 per night (as of 2016). The 41 tent-friendly campsites are spread along two connecting loops at an elevation of 1,600 feet. To reach Paradise Creek Campground: From Interstate 84, 40 miles east of Portland, Oregon, take exit 44 and cross the Columbia River on the “Bridge of the Gods” toll bridge into Washington. Turn right on Route 14 and drive six miles to Carson. Turn left on Wind River Road and drive 20 miles to the campground, located on the right just before a hairpin bend in the road. 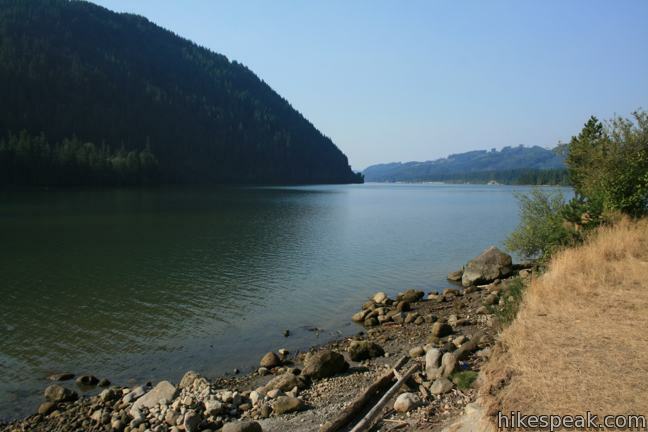 From Interstate 5, 140 miles south of Seattle and 25 miles north of Portland, take exit 21 on to Route 503 East toward Cougar and Swift Reservoir. After 56 miles (21 miles past Forest Service Road 83), turn right on Wind River Road/Meadow Creek Road and drive 7 miles to the campground, located on the left after a hairpin bend in the road. Which campsite would be the closest to the trailhead to summit Mt. St. Helens? I’m not sure which end it starts on. Thank you. 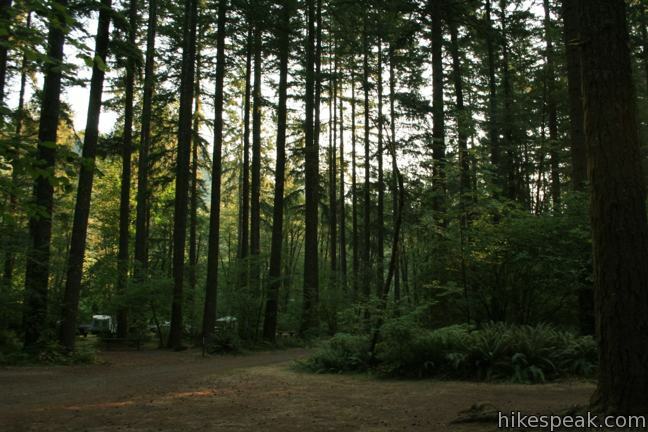 The common climbing route from the south begins near Ape Cave, so Beaver Bay Campground would be a good close option. Are dogs ok to have at Beaver Bay or Paradise Creek Campground and on the hiking trails. Dogs are allowed at both campgrounds. Nearby trails like June Lake Trail, Lava Canyon Trail, and Trail of Two Forests allow dogs. Hikes into tunnels and caves (like Ape Cave Lava Tube and Guler Ice Cave) do not allow dogs.